Dividing the world into ‘us’ and ‘them’ will only lead to new conflicts. This year, humanity marks a century since the start of World War I. A hundred years ago, events that occurred due to contradictions within a single civilization resulted in millions of victims for the whole world. And this happened even when mankind had seemingly already reached an extremely high degree of mutual understanding and progress. Nor was European civilization’s great cultural and intellectual potential able to prevent World War II, among the root causes of which was the xenophobic theory of racial superiority that gripped the minds of highly developed European nations. The Cold War was immediately born of WWII. A quarter of a century ago, the ideological basis for its continuation disappeared, the bloc of socialist states disbanded, and the Soviet Union collapsed. However, the former antagonists of that bloc did not follow this example; they not only preserved, but even enhanced and expanded their military and political infrastructure. They thereby preserved the preconditions to resume schisms and contradictions on the Eurasian continent, which have inevitably manifested themselves in the events of the last decades, ranging from war in the former Yugoslavia to today’s conflict in Ukraine. The West applied a policy of containment in relation to the multinational, multicultural Soviet Union during the cold war. But the Soviet Union is no more. There are no grounds to continue the Cold War. However, the West has not adopted a different or qualitatively new policy with respect to the successor of the USSR; that is, to modern Russia. And Russia? Does the West have a “Russia” strategy? An actual strategy? Followed by a European strategy, a Eurasian strategy, a global strategy? No, it doesn’t exist, and it never existed. If there had been a strategy, we would have, as France and Germany did when they created the European Union, concentrated all that time on what already unites us, not on what still divides us. But the entire experience of the past two decades shows that when it comes to policy with respect to Russia, an emphasis is made on differences, not on unifying factors. 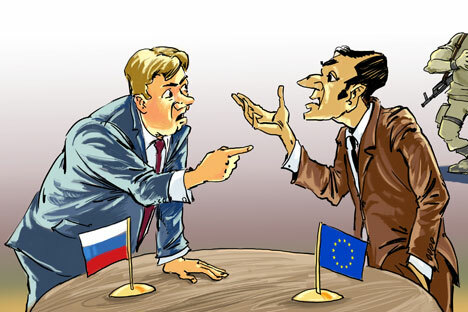 If we call a spade a spade, we have to admit that the West risks losing Russia by acquiring “new allies” on its borders. And this is the West’s main geopolitical miscalculation. Nothing dreadful will happen with Russia, but there will not be allied relations, and there will be no engagement at the global level. As long as we’re not together, there will be no victory over terrorism. There will be no victory over the threat of drug trafficking. There will be no solution to the problem of energy. There will be no solution to the problem of resources. There will be no solution to the problem of potable water. There will be no solution to the problem of sustainable development. The West is trying to portray the situation in Ukraine as the consequence of Russia’s imperialistic aims, which threaten its neighbors. However, this primitive view of the crisis in no way facilitates the search for ways out of it. The true reasons behind the tragic events in Ukraine lie primarily in an attempt to present the country’s internal conflict as the consequence of value conflicts between peoples, after which begins the game of dividing nations into “correct” (capable of grasping certain values) and “incorrect.” In reality, economic and social problems usually lie at the heart of conflicts that are portrayed as inter-civilizational. They are associated with persistent differences in quality of life, in national development, in the distribution of wealth, and in the directions of global resource flows. In Ukraine’s case, the desire of the nationalists to ignore the historical, national, and cultural traditions of their own country, to divide it into “us” and “them,” and then to turn their country into a nation only for Ukrainians is exacerbating all of these problems. The inevitable consequences of this policy vary from physical violence against civilians who disagree with that policy, to full-scale civil war. By the way, the latter has been made possible primarily by the unreserved support that Ukrainian nationalists are receiving from abroad. By contrast, the Russian example shows us that it is possible for different races, cultures, and religions to coexist within a single state for hundreds of years. The history of Russia is the history of a dialogue between civilizations. It has not always developed in the most ideal way. However, our country knew how to find a model for coexistence in the name of the common good, which makes its experience unique and deserving of study. Russia remains willing to contribute to developing an intercivilizational dialogue because it sees no other alternative. Precisely because it sees that the alternative scenarios offered – particularly mechanisms of unipolar leadership – have, in our eyes, proven that they lead to a dead end and are even dangerous. Humanity is entering a new era (albeit with difficulty) – an era of practical multipolarity. The time has come to prepare for it rather than cling to the recipes of the past.